Nowadays, the advent of mobile technology has given a great relief to all the users by making their life much better and easier than before. Today, the users may forget their wallets at their homes but, they never forget their mobile. And thus, they prefer to use this advanced technology of mobile phones for doing online shopping (potential way of making life quite simpler) with the help of a mobile app. The mobile application development and its market share have been increasing day-by-day, week-by-week, month-by-month and as well as year-by-year. As per the stats have taken in the year 2014 till October 2018, the revenue generated through global mobile e-commerce has shown a great jump from 184 billion U.S Dollars to 699 billion U.S dollars. This is the only reason behind the fact that “Why mobile app developers are no longer dependent upon in-app purchases for monetizing?” Instead of this, they started to focus on the banner and native advertisements as well. Even according to studies of some researchers like Harris, it has been proved that most of the U.S population (approx. 95%) prefers free apps. This percentage of people preferring the free apps has been increased to 96%, stated by affluent consumers. 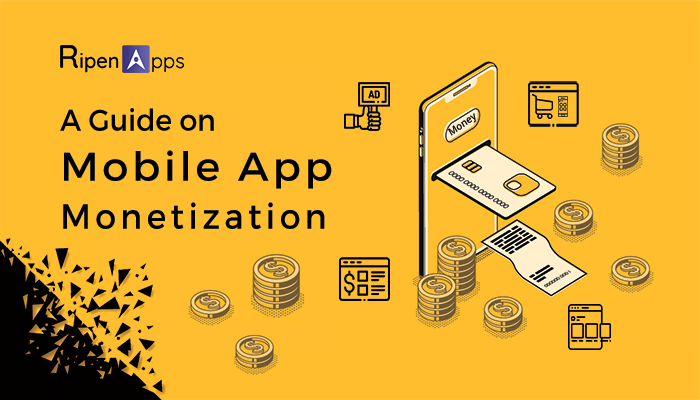 Before jumping to the discussion of these topics we shall give a brief idea about what actually mobile monetization i.e. how to make money with apps! The basic estimation of an application includes coming up with an innovative idea for a mobile app and converting that idea within a reality. Even if your mobile application is live it’s not yet late to monetize the application. Thus, App Monetization refers to the process of getting the revenue through an application. How to choose correct Monetization for your App? What are the benefits of using your application? Does it ever serve a need? What type of unique features provided by your application? The time required for engaging new users with your application. What is the targeted audience within your application? Nowadays, it has been basically proved that today most of the companies are integrating additional features to their mobile applications that are available for price and users can easily get these purchases, if the deals shown to them are effective. Usually, it has become one of the trending ways for the users to download the application that is free and thus, these allows the companies to attain substantial opportunity to increase the rate of conversion by offering them the best additional content at their desired price. Native ads are one of the top trending methods of introducing the brands in front of the audiences. Even it has been proved through stats that the popularity attained by the brands within the years from 2012 to 2018 has been increased rapidly. For an instance, the share adopted by native ads is 56% of the online advertising in the US and it has been predicted that this percentage would increase to 74% within 2021. Banner advertisements are meant to indulge traffic to the website by connecting it through variant deals. This is one of the best ways to advertise or display the ads having consistent images, content, animated images or several media as this attracts more customers than native ads. The banner ads are also one of the best medium for a brand to reach the targeted audience. How do Banner Ad Work? Banner advertisements work in the same manner as the physical banner works pasted outside the shop, thus aiming at the concept of attaining the entrance of customer within the shops by either showing them a wide percentage of discounts on specified products or launching a new product that sparkles with impressive curiosity. The basic idea behind banner ads is to generate traffic to a website by linking it with some specific deal. But the main facts that need to be kept in mind is the content that has been written on the banner as well as its overall structures in order to make it work it as per your expectations. Hope this article helps you to understand how to make money from apps & how beneficial are these mobile apps. To know more about mobile app development and related assistance, get in touch with RipenApps. Contact us on info@ripenapps.com.